Lola Pearl Bake Shoppe: Glitter, glitter everywhere! Obsessed with all things glitter, one booth in particular at the Great American Scrapbooking Convention, caught our attention. It was like entering glitter Mecca. The woman responsible? Barbara Trombley. We were welcomed with a warm bath of "princess powder" (canary yellow glitter) smeared onto our arms. 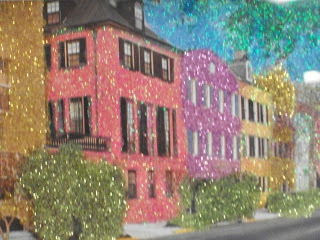 The colors of her glitter collections were beautiful, and the textures were remarkable! I especially loved the "dazzlers" collection! Check it out! Fun fact: Barbara's glitter has been used on the runway by Victoria's Secret! Use her glitter glue and ultra-fine metal tip to create a masterpiece like this one of Rainbow Row, in beautiful Charleston, South Carolina!